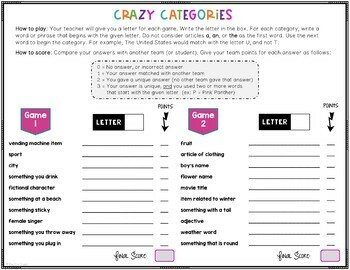 Fun Scattegories type games! 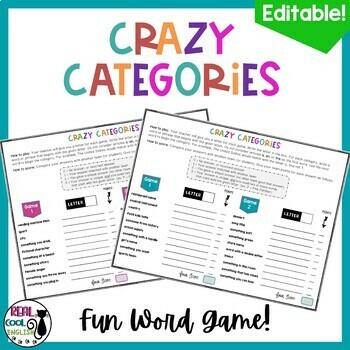 There are 10 games in total, and it also comes with an editable version so you can tweak categories to meet your needs or even to customize your own categories. Individuals or pairs challenge other teams to come up with original answers for each of the categories. Great activity to liven up a class or for just a fun break. ➜ ➜ ➜ If you enjoy using games and puzzles in your classroom, consider purchasing Word Games and Puzzles Growing Bundle and save! I ❤ followers! click the FOLLOW ME link to get sale alerts, updates and news about future products.